New technologies and computational methods are introduced virtually every day to improve the use of “omics” in diagnostics and precision medicine. While most of these are either genuine improvements to existing technologies or represent a new method or technique, the vast majority of these introductions only effect incremental change. However, some products—whether due to technological breakthroughs, leveraging existing technologies in new ways, or simply by taking a new approach to existing challenges—have the potential to allow scientists to make quantum leaps in productivity or reimagine their approaches to old problems. Here we highlight five technologies we believe will make a lasting impact. The company’s workhorse is its versatile 3D printer BIOX, featuring a patented “clean printing technology”—a small positive pressure chamber on board the printer that creates a clean printing environment for the biomaterial and thus eliminates the need for a cleanroom environment. The system features three interchangeable print heads that can either heat or cool the bioink for optimal printing, depending on the ink’s viscosity, and features both pneumatic and inkjet extrusion. The printbed, too, is carefully temperature controlled, which allows the bioinks to be cooled immediately upon printing to maintain their 3D form. 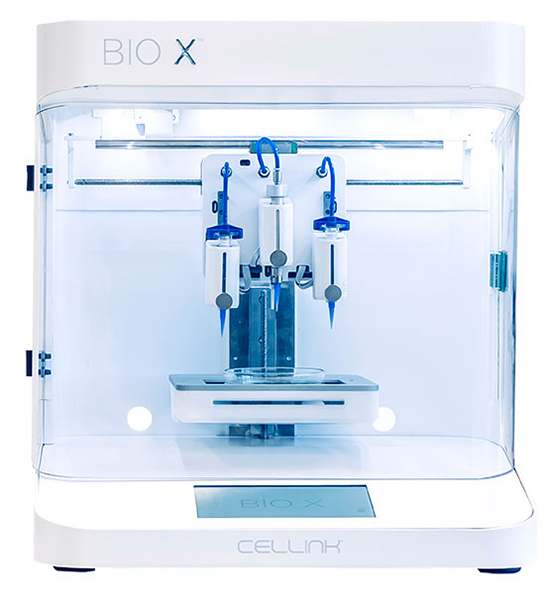 While CELLINK has shot out of the pack in the 3D bio- printing world, and its technology is groundbreaking, it is still early days, especially if you consider the Holy Grail of 3D bioprinting—the creation of entire human organs— which is many years away. Today, CELLINK’s customers range from biomedical research institutions and pharma- ceutical companies to cosmetic companies. With such a printing technology at their fingertips, scientists already have developed methods for printing 3D models of cancer- ous tumors—for research to better understand the tumor microenvironment—and organ tissues, among others, all intended to speed development of new drugs. When Peter Schols, founder and CEO of Belgian variant interpretation software company Diploid, first began provid- ing services to labs and hospitals in Europe and the United States shortly after its founding in 2014, he was struck by the lack of efficiency and manual processes required to try to pinpoint the causal variants of rare disease. “We wondered why can’t software just figure this out by itself? Why do we sometimes need to manually go through 50, 100, or 200 vari- ants before solving a case?” Schols asks. So Schols and his team looked to tackle this problem, via an in-house development project considered a moonshot at the time—creating software that scours 4.5 million variants and picks the one variant, or the small handful of causal variants, responsible for a patient’s disease. When the proj- ect was launched, some at Diploid wondered whether it was even possible to remove the geneticist and manual interpre- tation from the equation. What was once an internal code name for a project some thought was not possible, has now become the product Moon, software that can take a patient’s phenotypic data and genomic data and provide a disease diagnosis in five minutes. Battle tested by Stephen Kingsmore, M.D., in the NICU at Rady Children’s Hospital, which holds the world record for the fastest genetic diagnosis, Moon has been deployed worldwide at such prestigious institutions as the Antwerp University Hospital, Belgium, The Swiss Foundation for People with Rare Diseases, and at the National Institutes for Health in the U.S. The technology significantly leans on artificial intelligence to filter and rank genetic variants and provide autonomous interpretation of a patient’s genome. Moon continually updates its knowledgebase using natural language processing technology to “read” an average of 45 new publications each week on human genetics and rare diseases. Not content to reduce the time to answer to five minutes, Moon squeezes even more time out of the process via natural language generation (NLG) technology to auto- matically write a first draft of the diagnostic report. It’s no secret that error rates in variant calling are a long-standing issue in the sequencing world. While the error rates are small in percentage, when you consider the 3 bil- lion base pairs comprising the human genome, they can add up quickly. To the folks working at Google AI, they posited there might be a new approach they could take to poten- tially improve variant calling by moving it from statistical and mathematical approaches to a visual approach, enabled by existing artificial intelligence and machine learning tools. Thus was born DeepVariant, an open-source visual vari- ant calling tool that was released to Google Cloud at the end of last year. The team that created DeepVariant were no genomics neophytes, counting among its leaders Mark DePristo and Ryan Poplin, both of whom helped create the variant discovery tool GATK while both were at The Broad Institute. In a nutshell, in order to employ visual analysis to sequencing data, the Google AI team assigned different colors to three classes of data: each of the four base pairs, the quality of the sequencing at a given location, and on which strand the base pair was located. Using the color-coded sequencing images, DeepVariant was trained using the GIAB reference genome, using tens of millions of replicates. While Google says the calling of DeepVariant is more accurate than existing, widely used statistical methods, it still has one more hurdle to clear if it is to become the go-to method among the scientific community: speed. The visual interpretation takes significantly more computing power than existing methods and takes about twice as long for results. Nevertheless, as computing power improves, adop- tion of the tool should continue to surge. As long-read nanopore sequencing continues to improve its accuracy and read lengths, and adoption of the method spreads, companies have now added the creation of tech- nology platforms for specific applications to their ongo- ing efforts to refine the technology. Nowhere is this more apparent than at what is perhaps the preeminent company in the field, Oxford Nanonpore. The company, known for its MinION portable, credit card-sized (or smaller) sequencing device, has busily added platforms to serve different market niches. For instance, one of its newer entries, PromethION, is a benchtop system geared toward those conducting large-scale sequencing projects. While it runs the same workflow as MinION, the new system can run 48 flow cells—each with 3,000 nanopore channels— either concurrently or independently. The key element is an array of copper electrodes that connect to the plastic flow cell when it is snapped into Flon- gle. Brown notes that this aspect of the design, which was needed to create a single-use plastic flow cell, limits the number of channels that can be run, down to 128 compared with MinION’s 512. “That’s limited by the forces you need to make the connections,” he adds. “But it is getting better. Every time we go around the design iteration, we increase the number of channels.” Oxford Nanopore anticipates Flongle will deliver 1GB of data, but also believes users of the product aren’t necessarily interested in more data, but a quicker answer to specific questions, a purpose for which it is uniquely suited. Fast, accurate, and portable are three of the sought-after characteristics in the race to create technologies that not only can bring molecular diagnostics into the physician’s office, but also into the field to provide health and diagnos- tic service in even the most remote locations. Enter Q-POC, a small, wireless point-of-care molecular diagnostic platform that leverages PCR to provide diag- nostic results in less than 20 minutes from the time the sample is collected. The device employs both ingenious modifications of existing technologies and patented technologies for cell lysis, and DNA extraction, amplification, and detection. The system uses a microfluidic cassette that can accept up to 250uL of sample. Sample prep employs a modified off-the-shelf cell phone motor equipped with a blade for lysis. A novel filter for DNA purification captures carbohydrates and proteins while leaving DNA in solution. The PCR mix is circulated through three different temperature zones to generate a qPCR read- out. Once the qPCR portion has finished, Q-POC flows the amplicons over a microarray to interrogate the amplicons. According to Jonathan O’Halloran, CSO of QuantuMDx, the tool is “great for drug resistance testing, or speciation, syndromic panels” as well as other applica- tions. A significant goal for the company now is to reach a price point for molecular diagnostics that can compete with central lab pricing. “With our very low costs, rapid turn-around times of 7 to 20 minutes, and high multiplexing, we believe we represent the next-gener- ation of molecular point of care and have the technology that will finally see mass uptake of MDx POC.” The com- pany also has its eyes on world health applications. Its small, lightweight profile, wireless connectivity, and battery powered features position it well for remote locations where electricity may be intermittent or non-existent. Q-POC will be available to the market later in 2018.